When Major David Du Bose Gaillard was summoned to work on the construction of the Panama Canal in 1907, the Isthmus was viewed by the rest of the world as a graveyard. Gaillard, however, dutifully accepted his post with the Isthmian Canal Commission and said goodbye to friends in the United States, many of whom never expected to see him alive again. Ironically, his life would be cut short, but not by the pestilence in Panama. In fact, rather than being the death of him, Panama became his ticket to immortality. Gaillard was born September 4, 1859, in South Carolina. He graduated from the U.S. Military Academy in 1884, fifth in a class of 35. After studying 2 1/2 years at the Engineer School of Application, he launched a solid career with the U.S. Army Corps of Engineers, working on rivers, harbors, fortifications, boundaries, aqueduct, and dams in several states until the outbreak of war with Spain in 1898, when he was appointed commander of the third U.S. Volunteer Engineers. In 1903, he was picked to serve on the new Army General Staff. 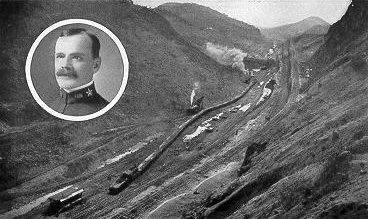 The corps of 44 officers also included George W. Goethals, who was later to become his superior as chief engineer of the Canal construction enterprise. Gaillard and Goethals arrived on the Isthmus together on March 12, 1907. There was no reception. Since John F. Stevens still occupied the official residence of the chief engineer, the two officers moved in with Dr. William Crawford Gorgas, the military physician in charge of sanitation, at Ancon. Gaillard and his wife, Katherine, later moved to the town of Culebra. After Goethals reorganized the construction effort, Gaillard was assigned overall responsibility for the central district -- which stretched 32 miles from Pedro Miguel Locks to Gatun Dam and included Culebra Cut. Described by a visitor as "the greatest liberty ever taken with nature," the digging of Culebra Cut lasted seven years from 1907 through 1913. In any one day, there would be 6,000 men and 50-60 steam shovels at work in the cut, with the dirt trains running continuously. Gaillard led the army of workers and machines quietly and clear-sightedly, as if engaged in any ordinary engineering task. But orderly it was not. Many were killed and injured in accidents, including the premature detonation of explosives. And then there were slides. The more they dug, the more digging there was to be done. As the cut grew deeper, the slides grew worse. A single avalanche of earth and rock could wipe out months of work. Gaillard described the slides as tropical glaciers, made of mud instead of ice. Gaillard, who had been promoted to lieutenant colonel in April 1909, completed the seemingly insurmountable task with the help of his dedicated diggers. The cut was filled with water, and the Panama Canal opened nearly a year later -- on August 15, 1914 -- six months ahead of schedule. But tragedy prevented Gaillard from seeing this great day. In 1913, following tremendous slides, he suddenly suffered what appeared to be a nervous breakdown and left the Isthmus never to return. A tumor was found in his brain, and after surgery and hospital treatment, he died in Baltimore on December 5, 1913. He was 54 and had been promoted to colonel only a month before. Culebra Cut was renamed Gaillard Cut on April 27, 1915, and a bronze tablet honoring his memory has occupied a prominent position there since 1928. 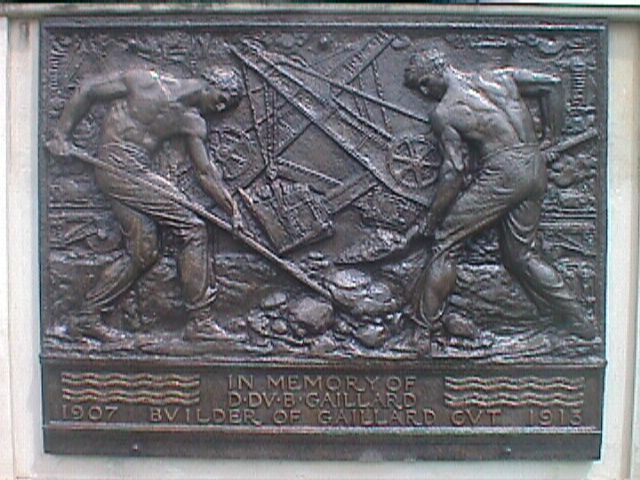 The tablet was provided by Gaillard's family and the regiment he commanded during the Spanish-American War. The greatest memorial to Gaillard, however, is the cut itself -- a lasting legacy that testifies to his proficiency and perseverance. Extended from its original 300 feet to 500 feet between the 1930s and 1971, the cut is currently being widened again after a long term program to increase the Canal's capacity and safety. The work will help the waterway meet the demands of the future. Improvements such as this, together with the Canal's commitment to preventative maintenance, ensure the heroic engineering accomplishments of Gaillard and other Canal builders will continue to benefit international commerce for generations to come.